Formed in 1940, Beltone has built a broad customer base throughout the U.S. and 50 other countries. Although it’s primarily a manufacturer of hearing solutions, it also has more than 1,500 offices throughout the United States, which provide hearing tests, adjustments and other services. Before actually choosing a hearing aid, Beltone allows patients to test them in the office and uses a sound simulator to demonstrate what some common situations would sound like with the hearing aid. 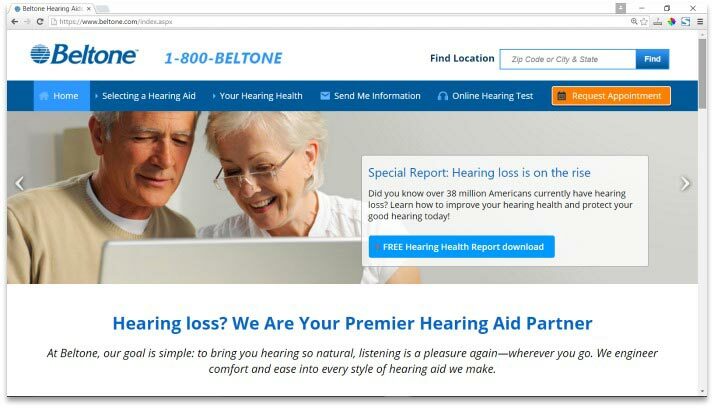 Beltone also stays committed to its customers even after hearing aids are purchased through its BelcCare benefit program. People who purchase from Beltone can expect to receive lifelong free annual screenings and inspections. In addition, if your hearing becomes significantly worse within two years, they’ll give you a new hearing aid designed for more severe hearing loss. Beltone also allows a 30 day period in which patients can return hearing products and receive a refund. Although Beltone is a large, international company, they have received relatively few complaints. In fact, in the last three years only six complaints have been reported to the Better Business Bureau. Customers seem to be overwhelmingly happy with the results of their hearing loss solutions and experience at Beltone. Many mention the variety of choices Beltone provides. Indeed, they offer seven types of hearing aids for mild to severe hearing loss, most of which are discreet, although a larger behind-the-ear style aid is also available. Users report a significant improvement in their quality of life, not just during face to face conversations. Hearing in meetings as well as outside or public environments noticeably improves with Beltone’s hearing aids. Customer care is also excellent, and patients tend to rave about the staff members they come in contact with in their local offices. The friendly and caring environment Beltone works to create has been a major draw, and patients often recommend the company. The catch with Beltone seems to be the limited one year warranty. Although you’ll continue to receive free annual check-ups for the rest of your life, if something goes wrong with the hearing aid after the warranty expires, patients are charged to service it. These unforeseeable costs can add up, which leaves some people wondering if they should have gone elsewhere. However, individual stores may offer longer warranties or the option to extend them. Another problem is the 30 day trial period. Many assume this means they will receive a full refund, but some stores keep a pricey deposit, leaving customers out a couple hundred dollars. Beltone has built a broad customer base throughout the U.S. and 50 other countries. They manufacture high quality products that are a bit expensive, but are best known for providing outstanding customer care. Customers are usually happy with the hearing aids they purchase from Beltone, as well as the outstanding customer service they receive throughout their lifetime. Most problems or complaints can be easily avoided by reading warranties thoroughly and seeing whether it’s possible to extend them. Before the 30 day trial, check to see if the deposit is refundable. Aside from these few issues, the hearing aids tend to live up to their name and reputation. Although original hearing can never be restored completely, Beltone’s hearing aids improve every day interactions and quality of life. If you do decide to purchase from Beltone, it’s likely you’ll walk away feeling satisfied. Have you had an experience with this company? Please share your Beltone reviews below.